It’s been almost a month since Jaco Geldenhuys (24), from Christiana in North West, plunged 4m through a roof at work. “I can remember every detail of what happened,” Jaco says about the accident on 27 February. He’s still in rehab at Witrand Hospital in Potchefstroom. He doesn’t know how his neck was fractured but suspects he might have struck a beam as he fell. He also fractured a several ribs. 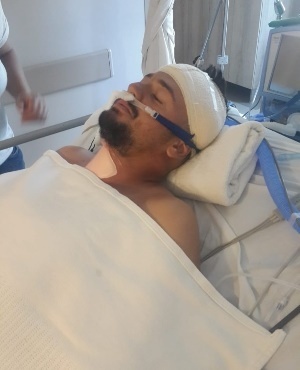 Trisha Potgieter (34), his fiancée, says Jaco sent her a voice message on WhatsApp as he lay injured. They have two children each – Jaco’s are Jakes (4) and Elena (2), and Trisha’s are Tristan (15) and Toinette (13). Trisha was waiting at the hospital when Jaco arrived by ambulance. “You start shaking. It was like it wasn’t really happening. But when I saw him it hit me,” Trisha says. Jaco spent a few hours in a Christiana hospital before he was transferred to another state hospital in Klerksdorp, where Trisha slept under his bed to keep an eye on him. After his parents intervened Jaco was taken to the high care unit of Mediclinic Potchefstroom, where he spent the next three weeks. Last week he was moved to Witrand for rehabilitation. He’s paralysed from the chest down but has some use of his arms. “I guess I’ve accepted it, but I believe God will heal me completely,” Jaco tells us. “I’m a positive person. God has given me a second chance. I’m privileged – I can talk and eat without assistance. Jaco and Trisha were going to tie the knot at the end of the year. They’d planned a “simple farm wedding” – but now he needs to get better first. It saddens Trisha, knowing how much Jaco loves being active in nature, especially fishing and hunting. “All I can do now is to be there for him,” she says.